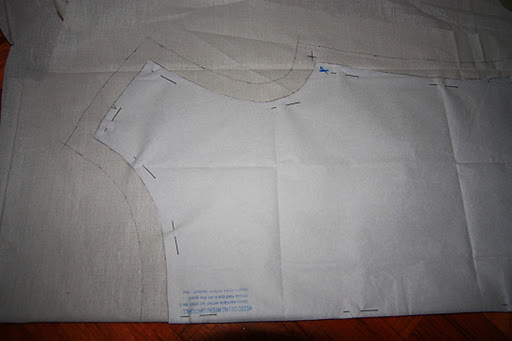 I’ve been waiting a while for this – getting started on one of those fabulous Marfy patterns I mentioned last year, specifically the blouse from pattern number 2465. 3. 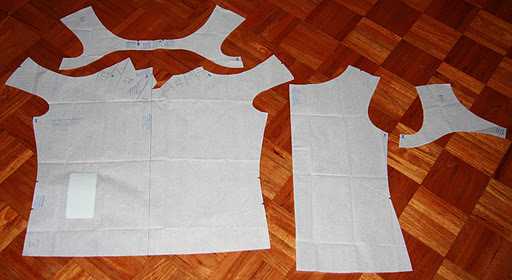 Before matching up your seam lines and actually sewing your seams. 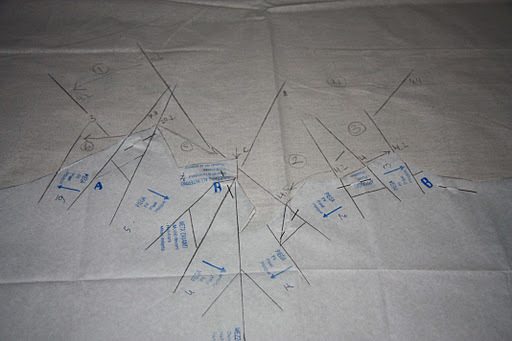 Oh yeah, and picking out the basting stitches afterwards of course. The most interesting thing here for me is to see what kind of ease Marfy allows for. 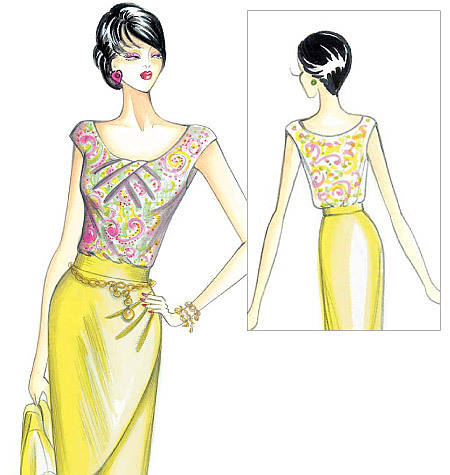 This pattern was bought as a size 46, which is a 96cm bust (37.8″), a 78cm waist (28.3″) and 100cm hips (39.4″). The website also lists a few more measurements which I paid zero attention too. Besides, Marfy say to pick your top based on the bust measurement, and garments for the bottom half by your hip measurement, just like all the other big pattern companies. But I was at a loss as to how to transfer these markings onto the silk I was planning to use. To the rescue, Marina from Frabjous Couture and Rachel from The House of Pinheiro happened to conveniently put together a post on exactly this topic – which you can read here. I’m planning to use a silk charmeuse half price remnant I bought on a whim, but which will complement just about everything in my wardrobe (and the things I’m still planning to sew before putting in my wardrobe!). 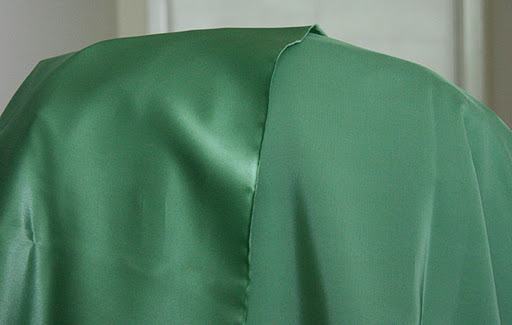 It’s a beautiful soft oak green in colour – I’ve got to stop buying green fabric! Geez! Impressive! I can't wait to see the finished version. Yes, that neckline is fantastic! 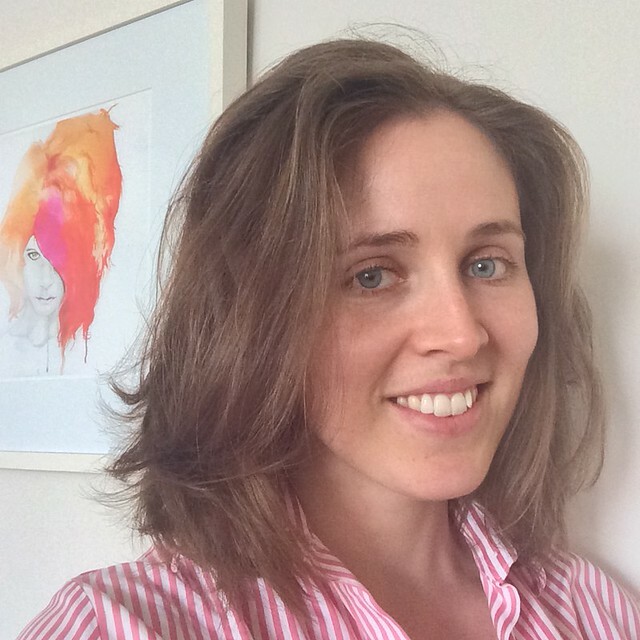 Thanks for the link on marking! That looks so complicated!!! Cheers to you for doing it, I know I couldn't! Great colour – will definitely look great in this pattern. 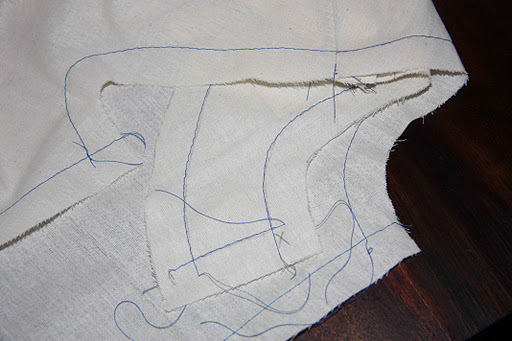 Those lines do look complicated – need to have some challenges in sewing. I am loving the neckline too! I can't wait to see more. Thanks everyone :) Lorna – I can see how it appears that way – my calico is unwashed and has a bit of a sheen so was hard to photograph. I also haven't ironed flat the seams, so they are a bit voluminous. 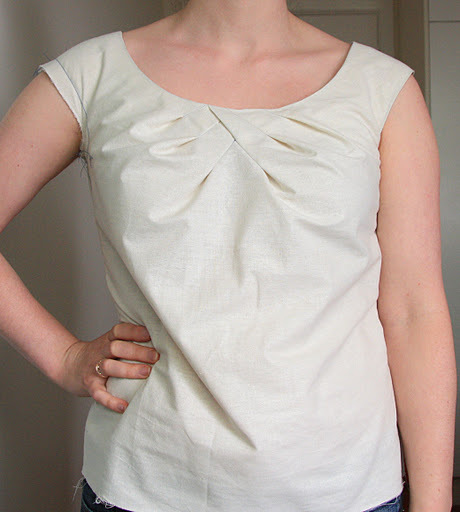 The pleat at the front that overlaps the three on the left IS just a fold though – it's not sewn down, but held in place by the facing pieces. Hope that helps! It's going to be lovely. The colour of that silk is absolutely luscious! This looks so exciting! Those pleats are something else. And I agree with Tracy, the mock-up looks wearable! Your silk version is going to be so amazing! I like it, the neck line is awesome! I can't wait to see the finished product. That is going to be a gorgeous blouse! And those lines make my head hurt – good on you for tackling them! Your toile is looking fabulous! Love the neckline detail. It reminds me a lot of a pattern magic top that I have being promising myself I will try and draft. I will be interested to see how you find the Marfy patterns go for ease. I have admired several of their designs but am concerned about sizing.